A demonstration on use of water absorbent polymer in Pomegranate to demonstrate the efficacy of different moisture conservation techniques was conducted. The water absorbent polymer was applied to pomegranate crop during late ambe bahar in March-April. 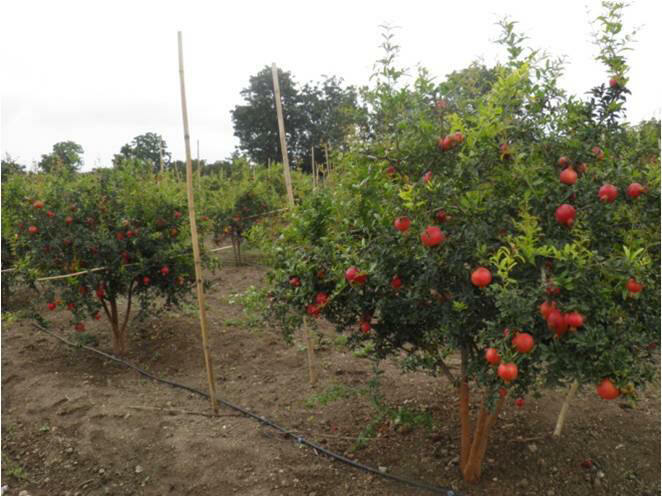 The application has been observed to very significant in reducing the prolonged water stress in pomegranate crop due to increase in available water in the field capacity. Also there was an increased flower and fruit drop in untreated control plots due to increased formation of abscission layer due to water stress. The irrigation through drip was extended from the normal 2 days to 3 to 4 days during the active fruit development phase. There was a saving of 14 lakh liters of water per hectare reducing the water demand to an extent of 35 per cent over untreated control. Similarly the fruit size and fruit retention was higher in absorbent polymer applied trees as compared to untreated trees. The fruit yield in treatment plot was observed to be 19.5 kg as compared to 16 kg per tree in control plots. The yield in demonstration plots was observed to be 157 q/ha as compared to 135.6 q/ha in control plots. There was an average increase of 13.7 per cent in marketable yield under demonstration. The efficiency of nutrients that were applied after the soil and leaf test was also observed to higher as the treated plots showed no symptoms of leaf yellowing or nutrient deficiencies. The campaigning by KVK along with State Department of Agriculture and ATMA officials by providing training for the extension functionaries have led to increased spread of technology promoted by KVK for surviving drought. The KVK has taken district wide initiative to reduce the mortality due to severe water stress. Similarly the KVK has also undertaken demonstration under ATMA for drought survivability of pomegranate plants. The technology of direct root irrigation was initiated and was ensured in most of the drought affected villages where the pomegranates are being grown on large scale.